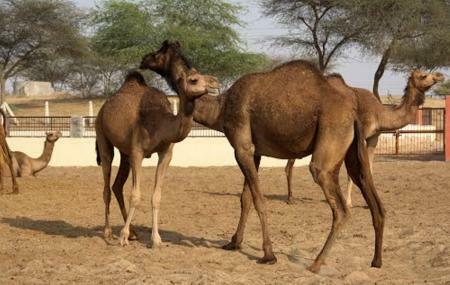 Find hotel near National Research Centre ..
A one of a kind research institute in the whole of India the National Research Centre on Camel is dedicated wholly to studying the ship of the desert. The place is a farm consisting of stables and enclosures where Camels are bred and taken care of, their needs and behaviour studied. Great amount research data is generated that are studied by scientists. There are even research programmes conducted for students there. You can enjoy a camel ride or even an ice cream made from camel milk. Ticket counter open till 6.00 pm. Ask locals for direction. Walk or take a rikshaw if possible. How popular is National Research Centre On Camel? People normally club together The Royal Cenotaphs and Camel-breeding Farm while planning their visit to National Research Centre On Camel. Very nice and interesting place. If you are animal lover just go and spend time there. You will love it with children. We have visited with group of friend and just enjoyed the time there. Have flvoured milk there and also may buy souvenir. Overall it's good. Would like to go again and want to know more about the camel and about there life etc. Enjoyed being there. Spent a good amount of time walking. The place doesn't expands over a large area. You would see many different breeds of camels. You may also find peacocks there. The camel products are also available, if you want to take one as a souvenir. This is centre government institute on camel. Camels are researched here for certain prospect. Tourist can have access here after paying a fee of 50 per person for indian and 200rs for foreigners. There are approximately 350 camels in this institute. Camel ride is available. Many articles are present in the shops like items made from camel teeth, hair and skin. You can have fresh camel milk , tea, coffee and ice cream. A small dedicated camel museum is inside. Nice place for a change. 2hrs are sufficient here. Try to visit in the evening as it's hot in noon. Nice place,full of camels,it's worth a visit and can have look on camel closer than ever.